A delicious finish to any meal, and perfect to make ahead for a dinner party. 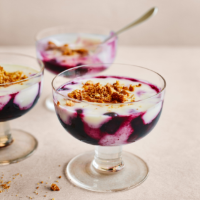 Light and fruity, with a crunchy amaretti sprinkle, this is one easy pud you’ll turn to time and time again. 1. Mix the blueberries and elderflower cordial in a small saucepan. Heat gently, shaking occasionally, until the berries let out some juices and are coated in a light syrup – about 3-4 minutes. Divide between 6 glasses or ramekins (about 175ml in volume) and chill while you make the lemon cream. 2. Rinse out the pan and add the sugar, cream and lemon zest. Set over a medium heat and stir together. Bring to the boil, then simmer for a couple of minutes. Take off the heat and stir in the lemon juice and yogurt until combined. Pour through a sieve into a jug. Carefully pour into the glasses over the blueberry compote and chill for at least 6 hours or overnight until set firm. 3. Just before serving, lightly crush the amaretti biscuits and sprinkle over the top of the pots. These are the perfect get-ahead desserts. You can make them up to 48 hours in advance and chill in the fridge until ready to serve.